Many developing countries are struggling to direct agricultural financing in more purposeful and moral ways. For instance, if contract farming was the main ticket out of poverty, most farmers who have been contracted to produce cotton, tobacco, sorghum and dozens of other commodities for generations would have completely moved out of poverty into sustainable self-reliance. The fact that progress has been unsatisfactory suggests a lot is still unknown. Rather than continue with traditional financing models where agricultural finance is put in banks, funders, including government, can consider alternative ways of directing capital towards improving communities as opposed to individuals. Targeted agricultural financing can result from accurately assessing demand patterns which are increasingly becoming diffuse. Unfortunately, banks are still using traditional ways of assessing financing decisions. For example they continue to prioritize availability of land, water, labour and other tangible assets. Unknown to financial institutions is that the definition of off-takers is evolving from referring to formal institutions like processing companies to encompass relationship-based niche markets whose characteristics can only be understood through robust evidence pathways. A decision to set aside a US$50 million horticulture fund should be informed by evidence from the demand side. Without evidence such a decision can see that facility going to less than 30% of farming regions where horticulture is prevalent at the expense of other deserving production zones. As if that is not enough, putting that facility in traditional banking institutions is like putting new wine in old bottles. Besides prioritizing their own funding models, banks will ensure such financing is accessible to individuals as opposed to farming communities and irrigation schemes which do not have individual financial identities. The fact that farming communities and irrigation schemes are not taken as private companies implies they will not access such funding although they may produce better outcomes. Just as farmers involved in the production of cash crops like cotton, cocoa, sugar cane and tobacco get first preference in accessing cash, actors in the informal markets such as farmers and traders should have a similar facility extended to them. That will add more meaningful value because a lot of cash circulates in informal African food markets every day. The fact that cotton and tobacco farmers handle cash once a year means that money does not circulate as fast and efficiently as in informal markets. Absence of a cash facility is the main reason why cash is not flowing properly along informal market value chains. Traders end up keeping cash within their networks. The end consumer buys commodities in cash from the vendor who also buys in cash from the trader who also buys in cash from the farmer. It means cash dominates the whole transaction process. Other means of transacting are not available to consumers. The farmer is the one who needs cash due to the absence of appropriate systems that can facilitate meeting of subsistence and other expenses such as school fees, medical expenses, transport and other uses which consume 70% of the farmer’s income. The other 30% goes to inputs. In the absence of appropriate transaction facilities, traders end up paying cash all the way. There is need for a cash model that covers middle actors like traders. That can be an overnight or weekly facility, ensuring availability of cash when traders need it. Currently, when a trader buys from the farmer using cash, s/he sells to the vendors using cash. By 10 am or noon every day, the trader will have finished trading and now keeping money which could be put in a bank if a facility was available. In some cases, traders who deal in bulk commodities like potatoes spend two to five days selling so that they build up cash for going back to the farmer. Ultimately the trader can go back to hoard commodities with $5000. However, during the time the trader is trading, s/he could be putting his/her money in the bank and only withdraw when s/he needs to go and fetch the commodities. A cash facility through banks can make this a viable option. The money should be in the bank and available on call. This model can sustain itself from the rate at which transactions take place (the velocity of transactions in informal markets). In this case, the speed of transactions becomes the main revenue stream. If such a facility is set up in informal agricultural markets, farmers who trade commodities like tomatoes over a week or two may see the wisdom of not taking money home every day but leave it in the bank. They can withdraw their money after a month when they want to buy inputs or invest in livestock. Eventually, farmers and other market actors see the convenience of paying school fees and meeting other requirements through the facility. A financial facility in the market can lay the foundation for sensible agency banking models to be built from the market. For instance, tomato farmers from different production areas can become connected with banks and other actors through the market via this self-contained financing model. The facility can be membership-based in such a way that members are given special cards that entitle them to priority status like what happens in some financial institutions. If tobacco farmers who do not use cash regularly have a special facility that enables them to withdraw $1000 a day, what about traders and farmers who handle cash every day? Since there are limited online facilities in most African farming areas, it is currently difficult to see how cash received by farmers producing cash crops like cocoa and tobacco travels along value chains. That is why a special agricultural marketing fund will stimulate agricultural growth. Financial institutions can easily identify farmers and traders in need of loans based on their special accounts with the fund. Ultimately farmers will bring cash into the banking system. Loans to farmers can be transferred into value chain actors’ accounts but repayment will be in the form of cash. Other options like buying inputs can be built into the facility. The model will have special rights that support sustainability. It will be membership-driven through subscriptions and enable purely cash-on-call. The facility will also make the introduction of plastic money smooth through nodes in the value chains. Eventually farmers will see no need to continue carrying cash. A major value proposition for this facility is in the velocity of transactions. A super-agent or aggregator will be responsible for facilitating the process through, for instance, handling cash flow requests for each day. At the moment, most agency banking models are not connected to other value chain actors. For instance, there are no Point of Sale (POS) machines among the majority of service providers in most farming areas. That is why mobile money models are not reaching their potential. When traders send money to farmers and the farmers do not get that money through mobile money agents, the whole system is not worthwhile for actors. To avoid some of these challenges, the cash model can be backed by a revolving loan fund which anchors growth and sustainability. If the market has $50 000 in circulation, the revolving fund can inject another $50 000, thus planting the seed for growth. Without smart ways of purposefully directing agricultural capital, opportunists will access finance at the expense of genuine aggregators who fully understand production and market dynamics. Most African countries currently do not have funding for genuine aggregators who can use their knowledge to build the capacity of producers so that they meet the deep needs of consumers. Instead, a few opportunists masquerading as aggregators are keeping knowledge to themselves and simply taking commodities from farmers which they supply to super markets without adding much value except a bit of cleaning, grading and packaging. There has to be mechanisms for avoiding conflict of interest between aggregating and knowledge brokering. At the moment, African informal markets fulfill an important knowledge brokering role by ensuring information is not hidden from actors. This is unlike opportunists who thrive on information asymmetry. Carefully characterizing actors will make it possible to identify genuine aggregators who share knowledge with farmers and consumers in transparent ways. As containers of knowledge, African agricultural markets continue to inspire, clarify and reorient our awareness. Latest evidence gathered by eMKambo shows how and why the movement of food from farming communities to urban markets is based mostly on relationships as opposed to money. Agricultural markets are not just an endless parade of stories and examples but enlightening ideas that spark immense possibilities. Energizing and empowering agricultural transformation cannot be achieved without seeing and sharing the whole picture. It is through making sense of things together that value chain actors can see the whole ecosystem and start honoring their collaborations. Agricultural commodities do not just penetrate formal and informal markets in a linear fashion. A new commodity begins with entering households where relationships foster adaptive consumption. People in different households share food, seed and other commodities via relationships expressed through gratitude for either paying a visit or hosting a traditional event where relatives come together. From households, appreciation of commodities moves to communities, cities and eventually, to the market. Associated knowledge is also transferred through relationships, emerging from households. This knowledge transition can happen along gender lines – father to son to son-in-law or mother to daughter to daughter-in-law. Knowledge can also transfer through age – old to young people in a community or through peer to peer food and knowledge exchange. Although these knowledge patterns are fundamental to the regeneration and sustainability of agricultural ecosystems, they are easier to take for granted. They remain largely unnoticed to modern commercial mindsets which are becoming used to linear processes like value chains. The movement of agricultural commodities from households to extended families and to communities cultivates local markets from which external markets can obtain what is available in particular communities. Adaptive consumption takes place from households all the way to markets. That is why most African agricultural commodities are associated with their original sources in terms of production communities. Visitors enter new markets through relationships and that marks the evolution of new relationships. Labour markets are also prevalent in most agricultural communities and such services are paid for through commodities whose value is agreed upon by the community. Where a farmer was supposed to go and look for money from a bank or borrow from elsewhere, labour payments are made in the form of commodities. This reduces pressure from the national monetary system because cash is not involved in every transaction. In most African countries, cash circulation is concentrated in urban centres and that means rural communities have less cash in circulation. Why should everyone who wants to eat food be forced to look for scarce cash when local commodities can easily substitute cash in ways that smoothen the exchange of valuable services and commodities? Relationships also play a critical role in building various food baskets riding on visits such as rural to rural and rural to urban, all the way to the market. As producers get into markets they build relationships through totems, home areas or through networks built by someone already in the market for a long time. These relationships drive agricultural transformation. Given different ecological regions that characterize many African countries, there are many cases where farmers from drought prone areas migrate to high rainfall areas, leaving behind many of their relatives. Eventually, those left behind create a market for commodities produced by their relatives who will have migrated to high rainfall areas. Seed, crop varieties and livestock breeds are exchanged through visits and these create a market in areas of scarcity. Relatives in high producing areas also function as a food reserve for their relatives in low production areas. In most cases, commodities kept for relatives do not find their way to the formal market. Rather than making conclusions on the basis of food that gets into formal and informal markets, it is important to find ways of figuring out volumes of food exchanged through relatives from one community to another. This practice has an impact on the functioning of formal and informal markets. Where markets will be expecting consumers to come and buy, relationships will be satisfying more than 70% of consumers’ requirements. When conducting visits, most people carry a farmer’s eye. A livestock farmer is on the look-out for good livestock breeds and same with a crop farmer. Farmers visiting their relatives like sons, daughters or in-laws in new communities use their local relatives to access good breeds and crop varieties from new communities. A community usually develops its own market in the local community. Through relationships, some commodities penetrate areas where they didn’t use to exist. For instance, Avocados from Makoni find their way to Chivi districts of Zimbabwe, same with mangoes and other crops making in-roads into new areas. Unfortunately, instead of supporting these natural and organic processes of food and knowledge exchange to unfold and continue, financial institutions and development organizations tend to intervene superficially when relationships and local markets can do a good job. Rather than spoon-feeding farmers and forcing them into narrow value chains, development agencies and financial institutions should carefully examine and support relationship-based food demand and supply models. They can also usefully support exchange of commodities between commodities to avoid situations where food leave communities to urban areas and then back to adjacent farming communities where they are mostly needed. Besides tracking and accounting for local food movements, such efforts can open new markets for diverse commodities looking for a market during long periods of the season. Community to community commodity exchange will prevent cases where commodities are pushed to urban centres before the market’s absorptive capacity has been ascertained. While local markets have existed for centuries, their recognition has taken too long. Many African communities are getting concerned about how their indigenous food and knowledge systems are being lost to scientifically-produced foods, at the expense of the naturalness of our food systems. This is also destroying the social fabric which was built through people congregating around local beer, mahewu and cultural practices in which food was a glue. However, the proliferation of ICTs is now making it possible for communities to capture the power of informal distributed markets that function through households, extended families, clans and communities. Lack of markets is provoking all these questions. Following a bumper harvest in Zimbabwe and other southern African countries, local communities are stuck with tons of commodities while local people continue to consume commodities from other countries or urban centres. For instance, many communities have tons of small grains like finger millet, pearl millet and sorghum yet industrially-produced opaque beer flows from urban centres to rural business centres when local resources badly need value addition into local beer and other products. This practice is also sweeping away the little cash available in rural communities back to urban centres. The good thing is that communities are beginning to revive their relationships through which to sell commodities. ICTs are empowering these processes to by-pass formal markets. This is also releasing pressure from formal and urban informal markets which can no longer cope with the influx of commodities following a bumper harvest. 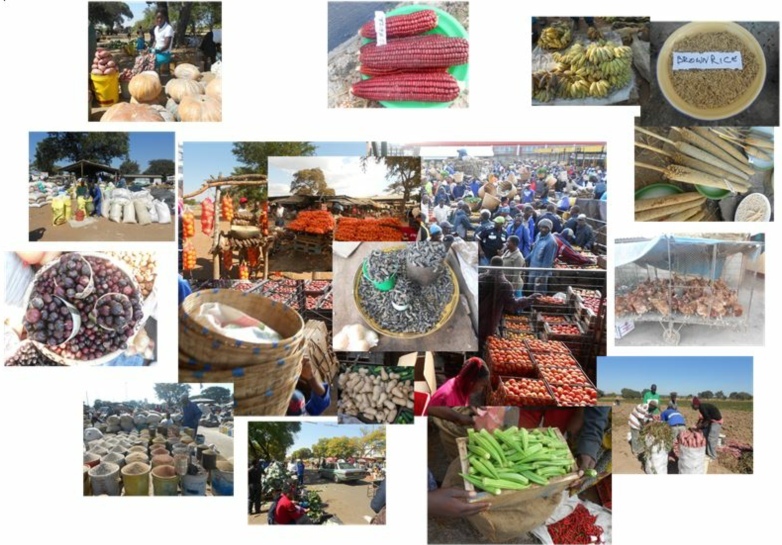 Commodities shared through these relationships include pumpkins, sweet reeds, vegetables and livestock breeds. Embedding rural economies and enterprises into the money economy has weakened local communities where commodities were previously used to obtain knowledge, skills and services like labour. Unfortunately, a few commodities being produced under contract farming models cannot be used as currency in cases where money is not available. For instance, a farmer cannot pay for labour through bales of tobacco because workers prefer money even if it is not readily available. On the other hand, farmers are compelled to put their best resources (soil, water & time) to a few contracted commodities. Models that were built through relationships should be revived so that commercial models can ride on these. Most SMEs that are now producing agricultural tools like ploughs and hoes acquired their skills from indigenous knowledge systems. This knowledge has moved to growth points and urban centres. Modern grinding mills were inspired by traditional grinding stones, mortar and pestle whose evolution can be traced to gender-informed traditional value addition practices. All this knowledge is on the verge of extinction, in the name of modernization. It should be captured and recognized as an economic driver for rural industrialization and development. For a very long time, each country has had what it considered a staple food for its citizens. However, climate change, globalization and changes in consumption patterns are disrupting traditional staple foods. My word web describes staple food as a necessary commodity for which demand is constant. Rather than continue promoting a few staple commodities, countries are being forced to think in terms of broad nutritional food baskets. A major question is: How can developing countries tap into the resilience and flexibility of smallholder farmers, traders and informal markets to build nutritional security for the next generation? One of the most under-estimated virtues of African informal agriculture markets is their capacity to harness the convening power of urban centres to pull together food baskets from diverse farming areas. As each informal market breaks bulk it mixes and matches commodities according to diverse nutritional needs. For instance, in Zimbabwe, commodities travel in bulk from Mbare market in Harare to Malaleni in Bulawayo where the local market consolidates food baskets for local consumers. This mixing and matching role needs to be fully understood because it influences consumption patterns. When the consumer budget is strained, some commodities are rejected. This is how commodities are given weight in terms of whether they are necessities or luxuries. For instance, luxuries like carrots, peas and cauliflower can sometimes be forgone in preference for tomatoes and leafy vegetables. A necessity is hardly substituted fully and that is why a tomato is always in the market because it is a necessity. For those that are considered necessities, when demand is high, prices tend to be high due to an intrinsic tendency by consumers to have an appetite for them. Lettuce, carrots, peas and fine beans are not produced in large quantities because they are sometimes considered luxuries not necessities. Unfortunately, while these are highly perishable, most countries have not developed appropriate preservation methods for them, besides putting in the fridge (which in some cases affects taste). In much of Southern Africa, food crops start flowing into informal food markets as from January all the way to July. This period accommodates 90% of commodities and their varieties. The diversity covers field crops, staple foods, cash crops, fish, eggs, varieties of meat, legumes and small grains. After harvesting, around March and April or May, farmers re-allocate their time from field crops to horticulture, poultry and fish farming, among other critical socio-economic activities. They start producing tomatoes and all kinds of vegetables. As the winter season comes to an end and water becomes low, farmers switch to commodities like carrots, peas and broccoli which do not occupy large spaces and use less water. While seasonal changes influence the demand and supply of different commodities, winter tends to have the biggest variety of commodities which translate to better nutrition. Consumers consciously decide what they can eat in the cold season. In winter Mondays, consumers take advantage of low prices to buy in bulk and avoid braving the winter cold going to the market. However, during the hot season, they can buy in small batches because trips to the market may not be affected by the weather. When bulk buyers come to the market once a week, commodity prices tend to be reduced during the middle of the week. Commodities like avocadoes, bananas and other fruits that are ripened on-farm or at the market ripen at a slower pace during the cold season and this affects the rate at which they enter the market. It is said sugar in these commodities influence the speed of ripening because sugar hastens fermentation processes which also influence taste. The cold season is also characterized by a broader nutrition basket comprising tsanga midzi, garlic, mhiripiri, lemon, magaka, masawu, tsunga vegetable, a wide range of fruits, zviyo porridge and other foods that are traditionally believed to cushion people against cold. The supply of chickens and eggs tend to be low during winter because chickens do not eat or drink a lot during this period compared to other seasons. With increasing awareness, consumer choices are influenced by nutrition although income is another determinant. Farmers who bring commodities to informal markets make it a point to speak to consumers so that they fully understand market requirements. Sharing knowledge makes it possible for them to become aware where tomatoes are being produced in abundance so that they decide to change to other commodities rather than going back home to produce what other areas are producing better and in more volumes. That is how knowledge becomes a builder and conveyor of nutrition baskets. During winter, most smart farmers who participate in the market acquire knowledge which they use to plan for the next season’s winter production. They get to learn what type of commodity to grow and when? Exchange of nutritional knowledge is also high during this period. Nutritional knowledge is associated with commodities and source areas. Each commodity has nutritional explanations from the areas where it is produced and used for subsistence. That knowledge is extended to the market and becomes a Unique Selling Proposition for particular commodities. On the other hand, the diversity of commodities on the market compels consumers to rationalize their budgets and pick commodities through nutritional lenses. They try to ensure their budgets accommodate fruits, vegetables, tubers, field crops – building a complete nutrition basket. In most cases they do it unconsciously without knowing specific nutrition elements or vitamins in their choice of commodities. Continuous evidence gathering is critical for identifying and updating nutrition basket drivers from various climatic regions. Such evidence should be built into models and investment plans towards national nutrition security reserves. Just as African countries build food reserves in the form of maize silos, they need to focus on building reserves of other nutritional components in order to balance the national nutrition equation. Continuous maize production and consumption exacerbates nutritional challenges. Up to date evidence can enable increasing the shelf life and consistency in the supply of nutritional commodities. Ultimately, it should be possible to build an all year round nutritional basket. Financing should be tailored accordingly rather than congesting funding in a few commodities in ways that skew the national nutritional balance. This big picture can only result from connecting the dots. To the extent that focus on value chains results in all support going to a few value chains, transformative agriculture can result from a unified nutritional basket framework approach. That way, financial institutions move from financing over-subscribed value chains like sugar beans, soya bean, tobacco, maize, cotton and sugar cane to funding elements of a nutritional basket based on gaps in the nutritional framework. Growing cash crops like tobacco and cotton in order to supplement missing nutritional elements is not sustainable partly because it is impossible for such measures to sustainably fill all nutritional gaps, some of which can easily be met locally. Climate change-induced food insecurity and global socio-economic instability compels us to continuously revisit food demand and supply models, especially in developing countries. Conventional approaches like the notion of formal value chains are no longer enough to fully understand food systems. In many African countries, it seems invisible Communities of Practice (CoPs) such as informal markets offer new pathways of forging new relationships and interpreting realities around food. Rather than present food as a mere market commodity, these CoPs demonstrate the extent to which food is linked to people’s identities. On the other hand, modern value chain approaches seem limited to the economic sense and tend to over-simplify soft issues like knowledge, trust and relationships. Yet in most African informal markets, knowledge sharing adds more value than processing commodities into finished products. By fostering knowledge exchange between different commodities and people, informal markets build national food baskets supported by different food sources and values. However, we cannot talk about food demand and supply models without mentioning the convening power of cities and urbanization. African cities like Harare, Lusaka, Nairobi, Maputo, Kampala, Kigali, Accra, Lagos, Addis Ababa, Lilongwe and Johanesburg, to mention just a few, provide larger ecosystems in which CoPs innovate, mingle, share and combine ideas from different vantage points and traditions. These cities draw together key sectors and economic drivers such as producers, transporters, buyers, processors, input suppliers, development agencies and government departments. Important players in this nexus are rural councils which are also contending with rapid urbanization. Knowledge Transfer Africa (www.knowledgetransafrica / www.emkambo.co.zw) and its partners will be convening a Knowledge Management for Development (KM4Dev) gathering in Harare (25 – 26 July 2017). The event seeks to inspire various actors and disciplines to engage and learn from the practices of informal food CoPs that connect production areas with urban consumers. While relationship-based food demand and supply models are increasing in many developing countries, lack of coherent knowledge pathways limits the extent to which these CoPs can influence development practice, theory and national food policies. Part of what remains unknown and unappreciated are informal food CoPs’ motivations, dynamic practices and contribution to regional and international food systems as well as the role of cities in food demand and supply. How do informal food CoPs respond to the needs of diverse consumers and knowledge seekers? What could be the potential role of culture and cities in shaping food demand and supply models? To what extent do existing theoretical approaches and concepts around food speak to the peculiar roles of informal food CoPs, urban centres and traders? How do informal food CoPs and traders negotiate power and neutralize the politics of food? What can we learn from the way knowledge travels through cities and informal food supply models? We will have explored the role of cities in empowering the participation of CoPs in food supply and demand models. We will have inspired new theories and interpretations of the social, economic, ethical, cultural and political characteristics of food systems. Story-telling (weaving food stories and local music) – Renowned Poet and Story teller: Chirikure Chirikure and Mbira music from local female Mbira musician – Hope Masike; story about how the local Mbira music. How Big Data and Social Media can surface knowledge in Informal Agriculture markets – Open Space Discussion led by the African Capacity Building Foundation. A keen interest by African farmers to know the price of commodities on the market is understandable. However, tracking activities in informal agricultural markets by eMKambo over the past few years has proved that price is not a major determinant of profit-making in agribusiness. Profit-making is a result of creatively managing production costs, quality, losses and aggregating commodities. The market is always available, usually with set prices. It is about how a farmer’s commodity becomes competitive per given price. As an ecosystem, the market is a collection of many factors including ideas and experiences. Profitability is about converting water, soil and labour into commodities that give you dollars and cents. Farmers should figure out best ways of converting their knowledge into products. Indigenous knowledge has to be embedded in competitive commodities not just price on the market. Price is just an expectation guide. A good price may mean nothing if a farmer has already incurred losses. Approaching agriculture from the market’s big picture provides a growth pattern that can enable farmers to make choices within available resources. Informed by the big picture, farmers can choose to diversify into high value crops. The market also shows who else is producing what a farmer is trying to produce and the number of players involved. Such intelligence will avoid the band wagon effect where farmers get into the same commodity irrespective of competitive advantage. Unless farmers track their commodities, it is difficult to intelligently plan and project outcomes on the market. Trends surrounding a farmer’s particular commodities can provide an idea on how the farmer can adjust costs and quality in line with his/her resources. The market provides a general map and guidance that empowers a farmer to make intelligent choices. Where the market segments commodities into 1st price, 2nd price and 3rd price, farmers have to fit their commodities in those price parameters. While lack of organized production in the whole agricultural sector can be beyond an individual farmer’s influence, commercially-minded farmers should make an effort to understand supply levels and competition dynamics in the market. It is also important for farmers to know other competitive forces outside their commodities. For any given commodity volume, price might fall or increase not due to gluts or shortages but due to new entrants and exits in the market that either stretch or release the market budget. For instance, if U$500 000 is circulating for given volumes of commodities in the market and one commodity, accounting for 5% cash in circulation, moves out of the market, it means the same budget begins to cover fewer commodities. On the other hand, if for the same amount of cash in circulation, a new commodity enters the market, the budget in circulation is stretched in ways that translate to less demand for other commodities. Buying power is determined by the influx and withdrawal of various commodities. Unlike the situation with mono crops like tobacco which do not have substitutes and whose price is determined by demand and supply only, in informal markets more than 70 commodities can substitute each other. For instance, following a good rainfall season, besides maize, other commodities like sweet potatoes and groundnuts start competing with maize. An increase in sweet potatoes means people will eat less porridge which is a derivative of maize. Sweet potatoes, pumpkins and cow peas all compete with maize. Farmers can also reduce losses through market-oriented production calendars that inform them when to produce. Understanding market standards and expectations also reduces losses. It is usually through a mismatch between market standards and expectations that farmers lose out. Another key issue is grading. If farmers do not understand commodity grades and how to aggregate their commodities, they end up depending on the market’s umbrella decisions about quality and other critical factors. When well-informed, farmers can be able to grade appropriately and push medium to high quality commodities to the market while low quality commodities can be re-purposed for livestock and other uses. Consistency in production and supply is also a very important factor. It is not possible for a commodity to perform well throughout the season. Farmers should specialize on at least three commodities in order to spread their risk. That way there are 60% chances of getting better prices. A strong relationship with the market can also be cultivated as farmers become famous for being consistent suppliers. Traders do not often want to waste time and resources looking for new suppliers. Commodities destined for the market face competition, based on factors like price, buyers, standards and specifications. When producing for the market, farmers should make sure the best resources are devoted in order to satisfy customers’ value for money. It is unlike when farmers are producing for satisfying their own household tastes. Consumers have competing forces on their budgets. Why should a consumer buy your sweet potatoes instead of bread?